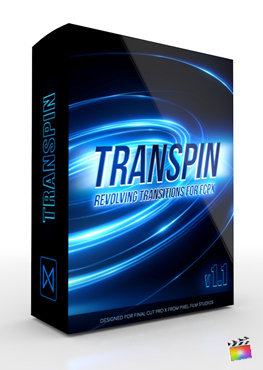 View cart “TransFold Volume 2” has been added to your cart. TransWall Flip is a set of powerful wall transitions created exclusively for Final Cut Pro. TransWall features a two layered animation that first pulls out of the clip A to reveal a video wall with up to 8 drop zones. Next, TransWall will rotate the video wall to fully transition into clip B. Seamlessly transition from one scene to the next with Pixel Film Studios transitions. The initial animation whips the camera into 3D space to reveal a video wall. Pick and choose from 7 unique presets with varying layouts that feature up to 8 drop zones. With the depth slider, users can determine the distance the camera pulls out. With the offset controls, Final Cut Pro editors can change the position of the video wall. Editors can choose from 4, 6, and 8 drop zone presets. Under Drop Zone Controls, users can utilize the “overall scale” slider to resize all drop zones at once. This control allows users to fill the void created by an increased camera depth. With the “pan” and “scale” parameters, editors can make more precise modifications to each individual drop zone. TransWall feature two basic Camera and Background controls that allow for greater customization. Utilize the background color control to change the accent and vibrance of the transition. Use lighter colors to elicit happier feelings and darker colors for a more serious tone. Under Camera Controls, users can find the The Angle of View slider which allows users to achieve added dynamics when the video wall rotates. Under “Animation 2 Controls” Final Cut Pro users can find the Rotation drop down menu. With this control, editors can determine how the video wall transitions into clip B. Choose to rotate the wall along the in X or Y access in a clockwise or counter-clockwise direction with the click of a mouse. Achieve new looks with incredible ease using Pixel Film Studios plugins. This tutorial demonstrates how to use Drop Zones in Final Cut Pro X. Once the installation is complete, and you have restarted both FCPX and your computer , you can find this plugin in the FCPX Transitions library. Click and drag the transitions in between your media. Click Here for a Video Tutorial. The transition needs more media to feed from. Click Here for a Video Tutorial. I installed TransWall Flip and see a red screen similar to this.